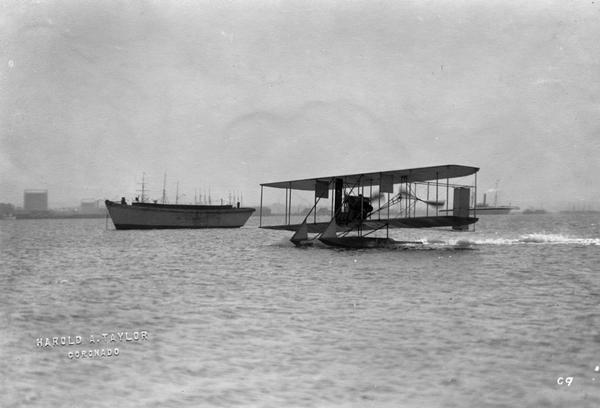 A hydroplane built by the Wright Brothers being tested by the U.S. Navy on San Diego Bay. The U.S. Navy purchased two Curtiss hydroplanes for testing. At the same time they bought one hydro developed by the Wright Brothers. The navy officer assigned to test the Wright hydro was Lt. John Rodgers, who learned to fly at the Wright School of Aviation in 1911. Lt. Rodgers was the cousin of Calbraith Perry Rodgers, who completed the first transcontinental flight in December, 1911. Cal Rodgers visited his cousin while Kaminski was at North Island, and it is probably this incident that explains the presence of a Rodgers souvenir postcard in Kaminski's scrapbook.